I usually keep my dish soap in an old hand sanitizer bottle, but ever since I cleaned my sink, it just wasn't fitting the prettiness bill for me anymore. So, while searching for a way to make something better, I came across this excellent tutorial. I was able to just use what I had on hand: a canning jar and lid, and the pump from the old sanitizer bottle. I think it turned out beautifully, and I love looking at it, knowing it was made from very simple materials. Another find was an idea I first discovered here, which led me to a recipe of sorts for homemade citrus cleaner. I'm hoping this will help with those hard water deposits I'm always battling around here. Every time I use a lemon, lime, or orange, I peel it first and put the peelings in a jar of white vinegar that's sitting on the windowsill above the kitchen sink. 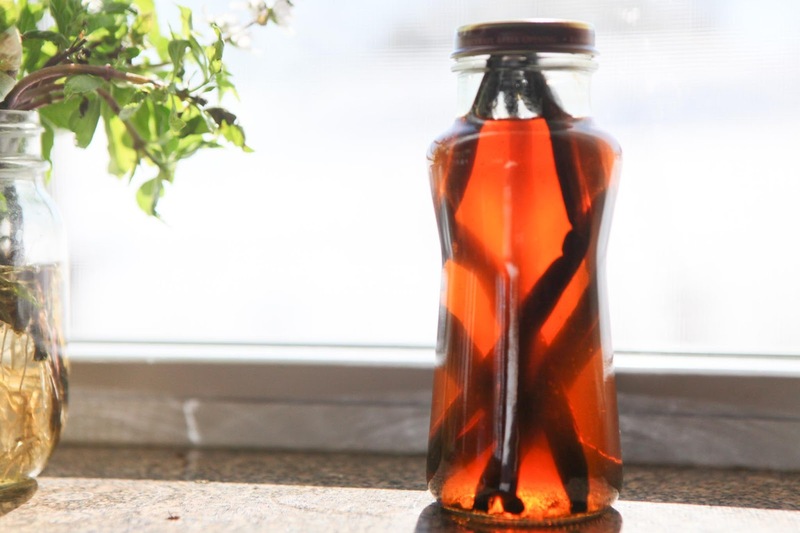 And just for fun, here's a recent look at my vanilla extract, which is coming along nicely. I've gotten in the habit of taking a few good swigs of it when I'm having one of "those days." (nah, just kidding!) It smells really yummy, though! Do you have projects in the works these days, too? I make the citrus cleaner too...smells divine and works well! 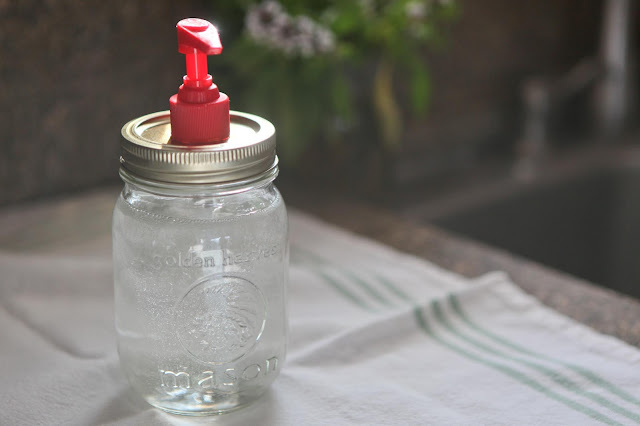 That vanilla extract does look swigable, lol!I love your hand wash pump...i have been reusing the same old bottle for years but this looks so much better...thanks for the inspiration!! I wish I had, but it's a little bit busy with my five-year-old staying home recovering from a surgery. Hope to start any (first) project soon. Love the first picture-idea! Hi Monique, Wishing your little one a very speedy recovery! Such a pretty idea, Jaime! I love that bottle, but we are in a stage where I do not know about glass near the sink. That stage is that we have an almost-11-year-old boy in the house! Ha! 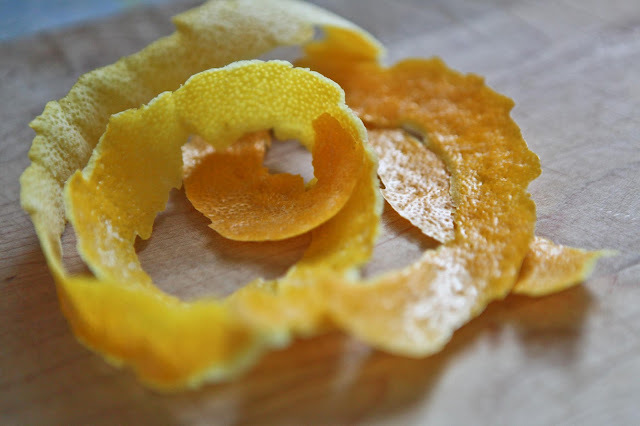 And I love using citrus peels in different ways...hate throwing them out. Maybe I will give that idea a go. And thanks for the laugh about swigging your vanilla extract brew! 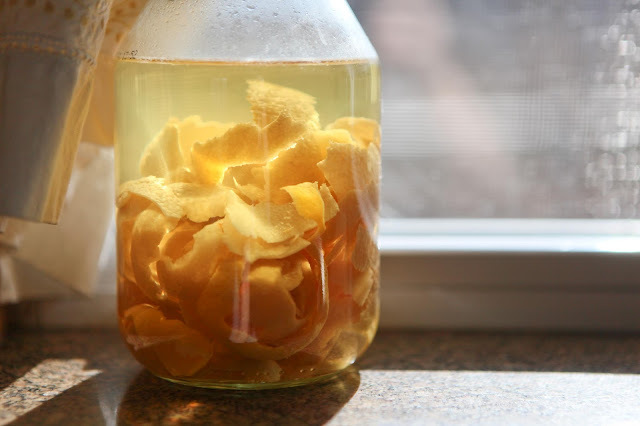 I am totally going to start saving my citrus peelings! And here I've just been composting them! And somehow I failed to mention that your soap dispenser is fabulous! Seriously fabulous. I so admired your knitted mini owl washcloths the other day that I made one yesterday. I used hot pink for the seed stitch border and purple for the center, then I added a crochet edging of two rows of single crochet in the purple. It turned out so cute that I don't want to use it! LOL!! Thank you so much for mentioning me! I LOVE your dispenser...it is lovely:). Oh, Julia, thanks to you for the wonderful tutorial! The soap dispenser is so clever! Thanks for sharing and thanks for the link. I will have to make one too. I am so making one of those soap dispensers this week, I am thinking great Christmas presents too!! And the citrus cleaner is genius, love it!!!! I'm going to try making your soap dispenser project. It will be perfect in my country kitchen. Too many projects to mention! That jar of soap looks lovely. I'll have to try it some day when I get some time. Wow! Love the projects your up to! Will have to keep them in mind! What great projects! I've been working on purposeful places in the home. i have made the citrus cleaner and the vanilla extract,too.it's wonderful. the jar of soap looks beautiful. i love the soap dispenser. what a great idea! i also love your bibs and washcloths in the post below. perfection! Oh I love this canning jar idea. Thanks for all the great ideas. I'll have to try the citrus cleaner too. Happy week to you Jaime!